DIY for everyone and anyone! I'm a trained electronics engineer who made a living marketing technology for close to 10 years. I build products in the industrial, automotive and wireless electronics space. I can be reached at hrishikesh@classbproject.com. Orders usually ship from India through FedEx unless there is a rare exception. All shipments are fully tracked and reach most international destination within 4-6 business days. For any specific queries about your shipping email me on hello@classbproject.com. 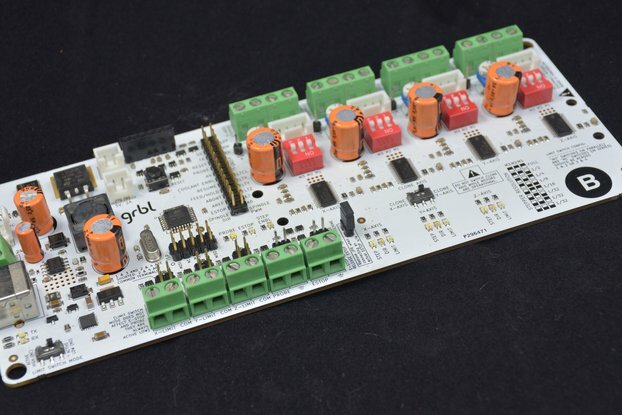 Great board; however has nonreplicable drivers so careful of current draw from stepper motors ..would nice if drivers were in sockets so they could be replaced . Thanks and noted. As long as you limit your current to about 2A, you should be good. A lot of logical thought went into the layout and design of the motionPro board. Each i/o port is clearly labeled and some even include short useful hints. One could almost say the user manual is printed on the PCB !. This is a full featured professional CNC controller !. Highly recommend ! Thank you John! :) Hope you have fun building with it. A great, easy and cheap alternative to controllers out there. Works as expected with easy hookups for all the suff you might need. What a great product. Well built, a big step above the average Chinese stuff you find on EBAY. All the solder joints looked great, the PCB was flawless and well labeled. Does what it is supposed to do, and does it more elegantly than an Arduino with a bunch of shields - for the same or less money. Shipping was great (DHL took it's time once in the US, but it was shipped to the US internationally in 2 days - was at my house in 5 from the order). Overall, very fast for a low rate. Documentation looks very professional, and is well laid out. I could have used a little more hand holding, but I might have just been a little slow. I'm sure it will be more than enough for most people. Plus, like I mentioned above, the board is so well labeled you really don't need it. I'd recommend this controller and stepper driver to ANYONE looking to make a CNC or Laser engraver.